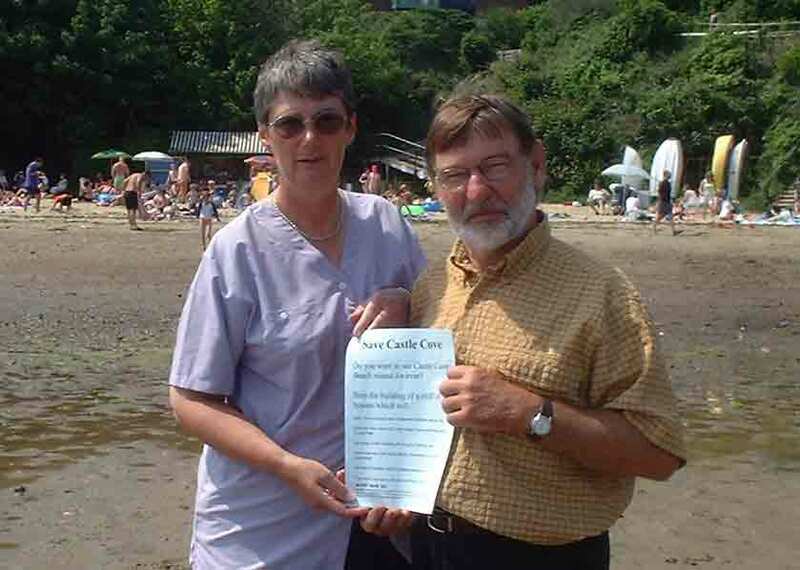 Prior to this application being rejected last year Ken and Anne headed a campaign to co-ordinate the views of local people and visitors, many of whom were incensed by the application. They prepared, with the help of the West Weymouth Conservation Society, a submission to the Planning Committee, the text of which forms the basis of this web site. An informal appeal hearing was held by a Planning Inspector at Weymouth Council Offices on 8th March. The Council officers presented a good case and there were enough local people present for the Inspector to get the message that no one locally wants it. Amusingly, the main plank of the developers' case was that they were improving the stability of local properties and the road. All for our benefit! But all the residents present were strongly against the proposal and those who wished to expressed this opposition. Representatives of the Wyke Regis Protection Society, English Nature and the Heritage Coast also expressed their views. The Inspector was very thorough. Not only did she do a site visit but she also viewed the site from every direction and went out into the harbour in a boat to see the effect from the sea. "I would like to emphasise a few points supplementary to the representations in correspondence already before you. There is no over-riding public interest to justify the radical departure from local planning policy represented by this application. The three houses proposed will do nothing for local people seeking a foot on the housing ladder. The likely price range will put them well beyond what most people here can afford. The former presence of a wooden summer house hardly puts the site into the 'Brownfield' category. Government planning guidelines (PPG 14 and 20) discourage development on land such as that now in question. The Bournemouth, Dorset and Poole Structure Replacement Deposit Plan takes a similar line. Rising sea levels and increasing frequency of severe weather events lend force to these guidelines. We know that stabilising measures can be taken, sometimes at great cost, where essential to protect valuable land and existing settlements. Such has recently been done at Newton's Cove to protect the Nothe Peninsular from direct assault from the sea in southerly gales, with great public benefit by way of a fine promenade. The massive works proposed at Castle Cove, just to accommodate three rather exclusive houses, is in our view disproportionate. The whole shoreline, from Ferrybridge to Bincleaves and the houses along the Sandsfoot shore were built a generation or two ago. Some have lost chunks of their gardens to landslips, and might well not receive planning consent today. 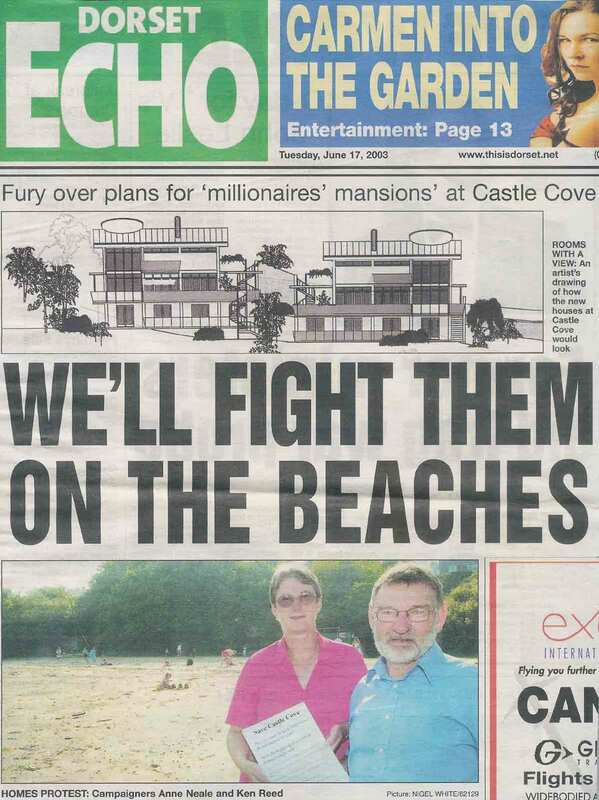 They should not be used as an argument for continuing to build towards Castle Cove. We do not know what effect the massive works proposed may have on the stability of neighbouring land. Finally, if public opinion carries any weight in planning decisions, we would have though that this is a case where it certainly should. Castle Cove is a well loved local maritime beauty spot, which would be irreversibly changed if this proposal went ahead."